Taking your friends and family out for a day cruise is just about the best way we can think of to enjoy the fall colors that are about to start painting the northern parts of the U.S. But dragging the leeward rail in the water, saltwater (or any water) spray mixed in with your hot cider, and snacks splayed out over the deck isn’t fun for anyone. Most people who sail in notoriously windy locals should have a reefable mainsail and headsail. The trick is to put to put the reef in before you need one. Your guests will have a much better time if they feel safe and stay dry, and your boat will be in a lot better shape at the end of the day if you plan ahead for the conditions. To make sure everyone’s having fun, we put together a few best practices on when and how to reef. An important feature of a roller furling headsails is having a foam or rope luff, that is, a tapered piece of material sewn into the luff that takes up the camber of sail when it rolls around the headstay, ensuring that the sail still has a clean flying shape when it’s rolled down. You can generally roll a headsail up to 30% before it loses its effective flying shape. When furling, you don’t want to fight the sheet, so before you furl, follow good procedure and be prepared: Get ready to ease the sheet, luff up into the wind to take the load off the sail, take up on the furling line to wind the desired amount of sail onto the headstay, and then tack up slack on the sheet and resume sailing. Good care and maintenance will protect your sail, make the job easier, and prevent loose sheets from flogging around and hitting someone in the face. Make sure to maintain control over the sail as you slowly lower it, especially with the high winds. It is good tradecraft for a sailor to reef the mainsail before they have to – and a lot easier. When reefing, the most important thing is to protect the luff of the sail. Whether you have a bolt rope main or a slide main, something is likely to get broken if you don’t have the luff tension on first. Let the outhaul and the vang completely off, and then drop the main halyard down to the desired reef position. Get the tack of the reef fixed and then winch up the halyard to put good tension on the luff –this keeps the sail pulled forward. 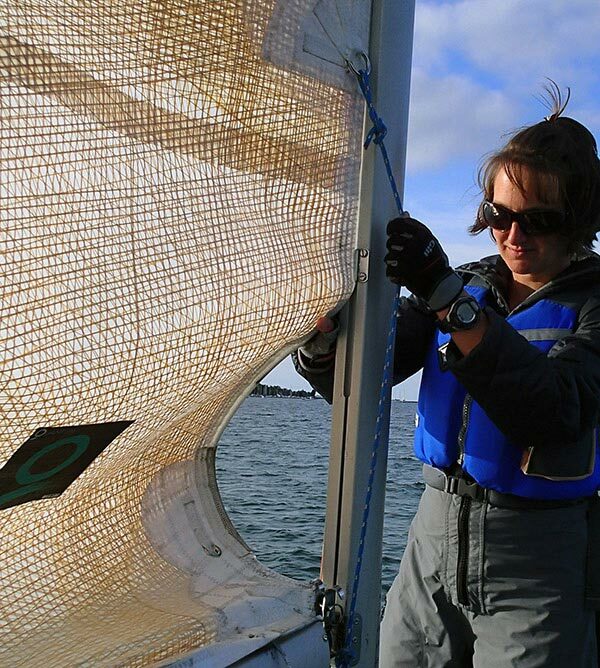 Once the luff is taught, you can take up the slack on the reef line on the clew, again making sure to put good tension on the foot of the sail. If you have a loose-footed sail, as most cruisers do, roll the reefed portion into itself and secure with sail ties or a heavy-duty shock cord. Take care not to tie the sail around the boom – it wouldn’t be the first time someone goes to shake out a reef and forgets a sail tie through a grommet and around the boom, ripping the sail down the middle. If you have a fixed foot, using one long shock cord to secure the sail (standard procedure on many racing boats) will help to prevent unnecessary damage. Once the reef is set and the sail is properly secured you can resume sailing. P.S. Furling mainsails can be reefed too. Just follow the procedure for your sail and system. If the boat is heeling over and main is washing out, the first thing to do is roll the jib down, but smart seamanship requires looking at the conditions ahead and setting up the boat early before you get overpowered. You’ll see the water start to whitecap consistently between 11–16 knots. If you see whitecaps ahead, you should be thinking about a reef in the main. Look to where you want to go—if the boats already there are well heeled over, put in a reef. Depending on where you live, other telltale signs may include kite surfers ripping across the waves, a low fog blowing in, or racing boats crashing and burning—you don’t want that to be you. Don’t wait until the conditions are too much. Being conservative is not only good for the enjoyment of your guests; it’s also good for your boat. If the conditions do get to be too much and you’re ready to head home, you may want to furl the jib and motor-sail home. Don’t go straight upwind; it’s not fast or good for the sail. Move the traveler to centerline, and sheet the main on fairly tight. Sail off the wind just enough to keep the sail just filled and have a slight heel. You’ll use half the amount of fuel and go the same speed making the engine more efficient. It’s okay to tack back and forth while motorsailing, and it will be a lot more pleasant than bashing straight upwind. You don’t have to shy away from windy fall days, just follow these tips and your cruise will be that much more enjoyable for everyone onboard.